Layer transparency is an important layer feature for special effect. With it you can control globally how much transparency a layer has, if any. Notice that the layer here is named Text. 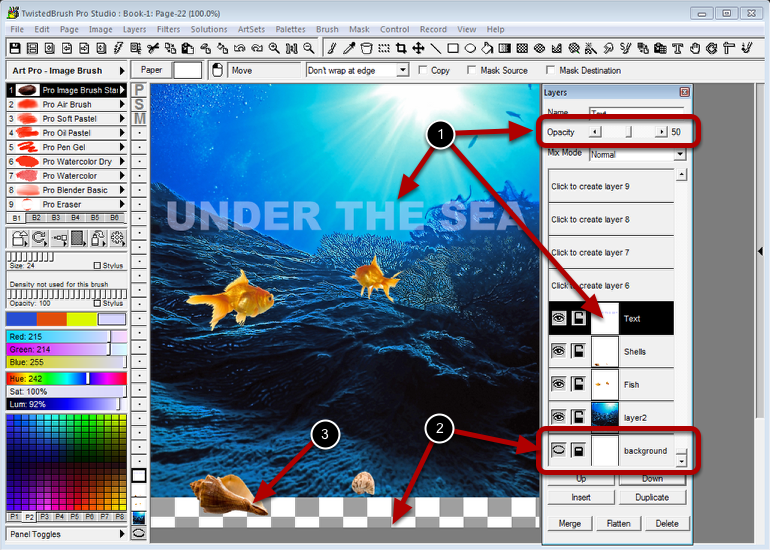 On this layer is placed the text "UNDER THE SEA" and the transparency for the layer is set at 50% with the Opacity slider. This allows for the text to be transparent. For example purposes background layer was made invisible. Notice the eye icon is closed. The areas of the image that are transparent a checkered pattern will be shown as an indicator that this is a transparent area. If you were to save this image to an external file type that supports transparency, such as PNG, the transparent area would be recorded into the file. For file types that don't support transparency this area will become white. Notice that layers above the background display as normal above the transparent areas.